This immaculately maintained country home with superb horse accommodations may be the pride and joy you've longed for! 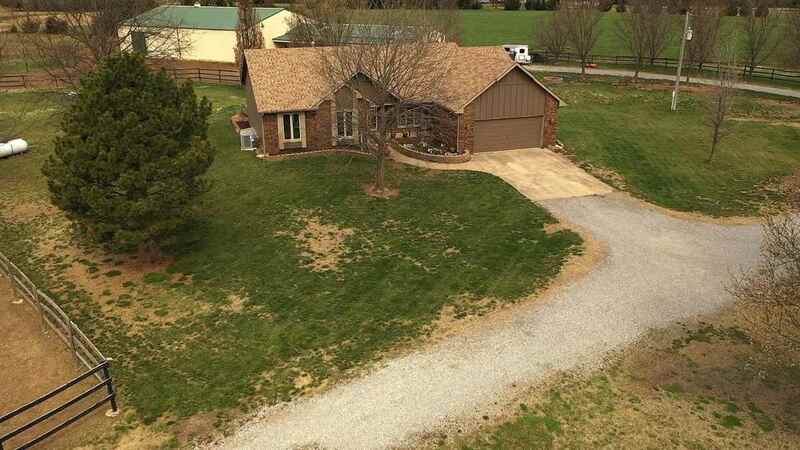 Be sure to view the virtual tour with aerial video to for the property overview and surroundings. Property is two tracts: 5.16 acre tract with all the improvements + 5.23 acre tract in Brome grass adjoining on N. This is a very convenient country setting on paved frontage to the circle drive, in Goddard school district and with a few other neighbors on similar-size parcels. Located on a corner parcel, with unpaved Myran Rd to the S, the 5 acres in Brome on the N and most of the depth of your property behind you, the balance of convenient access and privacy is just about ideal. And caring for your horses doesn't get much simpler as you can watch them in the corral from your back windows and be inside the 4-stall barn within a short stroll from the back door. Want to ride when the weather isn't so inviting - How about an indoor riding arena! If you love horses this place loves you back! Prairie Sunset Trail for biking/hiking crosses 215th just a mile or so N and Goddard has done some nice things along the trail where it courses through town. Goddard offers swimming and playground access and a new inside Natatorium and Health club is coming to Goddard's E side, on the S side of Highway 54/400! The house has been nearly totally remodeled during Seller's ownership. More description coming in the course of this weekend! Meanwhile let the photos speak their thousands of words.